Review number 600 (!) for this site comes with Deepwater Horizon. It was going to be Avengers: Infinity War (which I actually saw earlier today as I’m writing this), but I snuck this one in Friday night. Peter Berg continues with hit after hit, and his collaborations with Mark Wahlberg have been paying dividends. Berg is able to demonstrate the stakes at play in a film in quite an interesting way. He delivers big on the action, and does so clearly, but also has quite an eye for details. Perhaps the details are made up, or “factual liberties taken”, but in the context of the film, details play a big part in bringing the audience on board. One very minor one, but indicative of what Berg does happens early on in the film. While Mr. Jimmy (Kurt Russell), Mike Williams (Wahlberg), and others destined for Deepwater Horizon are being transported by helicopter, they’re struck by a bird causing a brief moment of panic aboard. It could be seen as an omen or a sign of things to come, but that’s really only in retrospect. The passengers on board paid no mind to it and went about their business. But to us the audience, who knows the disaster that is about to happen, see the warning this portends. At least for me, I view details like these as the little idiosyncrasies, the good stuff that really makes a story. Inconsequential, but adds a whole other level to what you’re watching. As I alluded to earlier, clarity is another thing Berg excels at here. Not only with the action, letting us get a clear picture of who is where and how the moving parts play out. Sure oil and debris is spraying and flying everywhere, but all the shots are framed and blocked in such a way that it’s more than just a big blurry blob of “crazy stuff happens here!!”. You can kind of make sense of it all, which is not always given with a big blockbuster. But even Deepwater Horizon specifics are clear. In very concise lower-thirds, Berg and the filmmakers define key terms and setup the key pieces of information about deep-sea drilling that we need to know. It’s not enough of a crash course in engineering and oil, but it’s enough the get you through the film satisfied, and should you so choose, some keywords to go look up for further reading after the film is over. Deepwater Horizon doesn’t take a lot of risks. It confidently portrays the story of the largest oil spill in U.S. history in a safe way. It focuses on the heroism of those aboard and the difficulties of their rescue. There’s hints of the environment, political, legal, and all the other controversial parts to the story but it never takes them head-on. 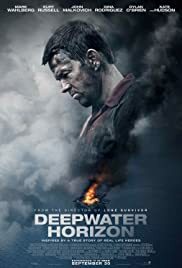 There are those who will say Deepwater Horizon should take on those elements, present an opinion about it. And while that may work, and could have brought the film more into the Oscars-level, I’m going to say let Peter Berg continue doing what he’s doing — because I like the films he’s making just the way he’s comfortable.